Select a stage to learn more. 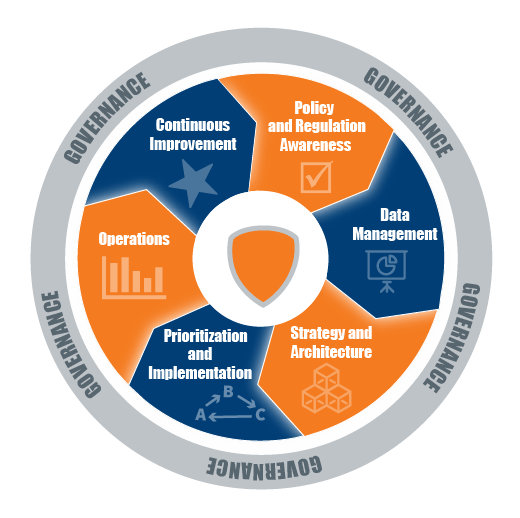 Establish the overarching organizational roles and responsibilities to help ensure the appropriate governance is in place to manage privacy within the organization. Ensure the organization understands and plans to meet applicable laws, regulations, and other requirements related to privacy. Ensure that the company has a complete and accurate inventory of data assets, that it grants access to personal data only to authorized people, that the data is used, ethically, only for the purposes in which it has been collected, and that the data is secure. Define and document privacy strategy, solutions architecture, and roadmap. The policies, standards, and procedures should also be defined, documented, published, and maintained. Implement the privacy roadmap, solutions architecture, policies, standards, and procedures in a timely manner within organizational, technical, resource, and budgetary constraints. Respond to privacy-related data breaches and monitor compliance with internal and third-party privacy policies while also responding to requests from individuals (rights of “to be informed,” “access,” “rectification,” “forgotten,” “stop processing,” and “data portability”). Continuously measure and improve privacy operations to help ensure continued adherence to changing privacy requirements.